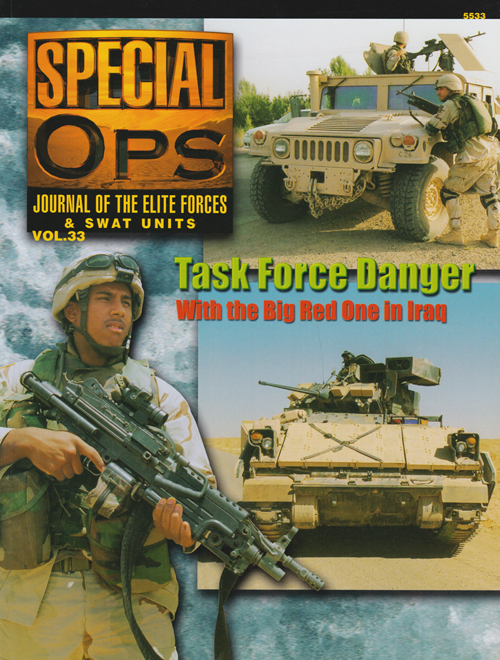 Tank-Masters.de took a trip to Iraq in mid 2004 amid a wave of suicide bombings and improvised explosive devices to bring us this report on the 1st Infantry Division „Big Red One“ with a focus on their operations. With a long and proud history, the 1st ID is the oldest continuously serving division in the US Army. The BRO seen battle in WWI, WWII, Vietnam, Iraq, Bosnia, Kosovo before deploying to Iraq again for Operation Iraqi Freedom 2 in early 2004. With a strength of 17,000 troops, the headquarters of the BRO is in Tikrit, situated 93 miles north of Baghdad. The AOR consists of the four provinces located north of Baghdad. Its mission is to partner with Iraqi civil and military authorities to ensure a secure, stable and self-reliant Iraq. Tank-Masters.de participated in a patrol with Task Force 1-77 in Balad, searching for IEDs and weapon caches. Next they took part in a combat patrol with Task Force 1-7 in Bayji to neutralize or capture non-compliant forces. Finally, they was invited to a night patrol in Tikirt with Task Force 1-18. The reports of these patrols are supported by action photos of the soldiers and vehicles of the BRO. Within the reports are photos of up-armored Bradleys with ERA, Abrams, M113s with filed modifications, different variants of armored HMMWV, gun trucks, soldiers with all kinds of weapons, gear and equipment.